The Iditarod. 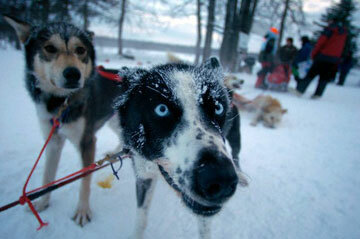 A dogsled race through the wilds of Alaska, wrought with history, danger, and tradition. Plus, it has cute puppies. Who doesn't love puppies? The Idiotarod. 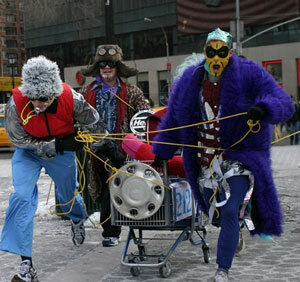 A race from Brooklyn to Manhattan with a bunch of crazy drunk people in flamboyant costumes attached to shopping carts and dragging the carts for the entire race. Who doesn't love crazy drunk people? It makes the pain go away. Yes, quite a few of them. For starters, four people must be attached to and running in front of the cart at all times. There will be referees along the route to disqualify cheaters. We'll release a more detailed list of rules a week before the event.